G. Franklin asks: Is it true that only two people in the world know the recipe for coke? The idea that the secret formula for Coca-Cola is only known by two people who are never to be allowed near one another in case of some disaster resulting in the recipe being lost forever is one of those pop culture staples people can’t help but perpetuate. Given this, it’s perhaps not surprising that the spread of this idea has also been helped by various advertising campaigns done by Coca-Cola claiming just this. In fact, this idea actually started as a result of a Coca-Cola advertisement, but we’ll get to that in a bit. First things first, the exact number of people privy to the knowledge of how to make Coca-Cola isn’t public knowledge; however, it’s definitely more than two as the sheer volume of the syrup being produced every day, with slightly differing ingredients in different parts of the world, necessitate that quite a few people need to know, at the least, large portions of the ingredients (and appropriate proportions of each) in order to keep supplies flowing. This sort of volume just wouldn’t scale well to only two people knowing how to make the product, especially if the extension of this myth were true- that each person only knows one half of the ingredients. Besides not scaling well, this would be a recipe for disaster (pun intended) if anything ever happened to one of them and it wasn’t written down elsewhere. This is partially why in one ad campaign Coca-Cola claimed the “two” executives are not allowed to fly on a plane together. At the least, it’s probable the exact ingredients, though perhaps not the exact proportions, are known by numerous people working at Coca-Cola. For instance, certain of the company’s accountants, particularly the higher ups, are probably well aware of what goes into the company’s staple product. Invoices would create a very detailed paper trail with which it would be very easy to get the exact list of ingredients, even if the company had different factories making different parts of the syrup. It would also be only slightly harder to figure out the exact proportions given the relative volume of each of the ingredients being ordered going into the factories, and the exact output of syrup coming out. Beyond those employees who have deduced the ingredients and potentially the recipe, how many are intentionally made privy to the exact recipe? As noted in this interview with the marketing manager of Coca-Cola, “not a lot of people know“. The subject of that interview, Jacquie Wansley, however admits that she doesn’t know the exact number of people who are in on the full secret. The other thing important to all this is that whether every person who knows the recipe all up and died at the same time is irrelevant. As you might expect, contrary to versions of the rumour, the recipe is written down and stored in a cartoonishly large vault in Atlanta, Georgia. It’s also possible (and very likely) that Coca-Cola maintains copies of the recipe elsewhere, whether in part, with different people having access to each portion, or as a whole. So where did this “only two people” legend start? Was there ever a point when only two people knew the recipe? Unequivocally, yes. The first person John Pemberton showed the final recipe to would have made two. After that, it’s pretty clear at least several people have known it at any given time. As for who the two were, Pemberton modified his “Pemberton’s French Wine Coca” to make Coca-Cola (partially as a response to the banning of alcohol in Atlanta, Georgia in 1886- the drink contained alcohol) with the help of Willis Venable and Frank Mason Robinson. One of those two seemingly would have been the second; this would have likely quickly become three, and more ever since. The secrecy surrounding the formula really began in earnest when Asa Candler bought exclusive rights to the recipe in 1891. (Previous to this, Pemberton had sold the original formula to three different companies, meaning even more people knew it at this point.) Once Candler had the exclusive rights, Asa supposedly had all copies of the recipe destroyed (or tried to) and relied on certain employees keeping the recipe memorised. Not a good long-term strategy for a major company, but this wasn’t the billion dollar behemoth it is today. It wasn’t until the company changed hands in 1919 that the formula was once again given a physical form, as you’ll soon read about. That said, Coca-Cola has claimed before that the recipe was never written down until 1919, but this strains credibility. It is unlikely Coca-Cola creator John Pemberton didn’t write down the many recipes he came up with in his quest to find a cure for morphine addiction, one of which resulted in Coca-Cola. When he taught it to others, such as members of the few companies he sold the formula to or those he tasked with making it, such as Frank Mason Robinson, it also would have been easier to simply write it down than to continually repeat it to them until they had it memorised. Coco-Cola has good reason to claim it was never written down in that there are a few copies of the recipe for some version of Coca-Cola in existence, or at least claimed to be that. For instance, in 1996 the great-grandson of John Pemberton’s employee, Frank Robinson, (who, incidentally, named Coca-Cola and created the cursive logo) had what he claimed to be the recipe written in his grandfather’s own hand. That hand-written document was the subject of a divorce settlement as Robinson’s wife claimed he had given it to her as a wedding present. Coca-Cola denies such claims, but of course the only way to verify they are telling the truth would be for them to reveal the Coca-Cola recipe. And, as long as they continue to deny it, it really doesn’t matter if others have the recipe. Take the exact Coca-Cola product and put it under a different brand who can’t claim it’s the exact same product, and even if it were much cheaper and taste tests showed no one could tell the difference, most people would still buy Coca-Cola instead. This brand loyalty is largely why New Coke was killed off so quickly despite it overwhelmingly being preferred in taste tests, even by people who were fighting to get “Old Coke” back. Further, in order to fully replicate Coca-Cola, in the United States at least, you’d need something only one company has access to, coca leaves. Currently, only Stepan Co. can import these leaves into the United States. They then process the leaves and sell the cocaine-free extract to Coca-Cola and the cocaine to the pharmaceutical company Mallinckrodt. Thus, to make your own Coca-Cola, you’d need to convince Stepan Co. to branch out and sell to your company too. This is likely a tall order considering the pressure Coca-Cola would put on them not to. So why did Woodruff keep the formula written down? If the few versions of the recipe that exist in the public eye are valid, it’s not like it’s that complicated a formula. It would not be difficult to memorise. Well, the answer has less to do with people being able to read the formula and more to do with what it represented, something special, which is the same reason even to this day Coca-Cola plays up the existence of the highly secured recipe in written form and at various times has been happy to stoke the flames of the “only two people know” myth. By playing up to the secrecy surrounding the formula, Woodruff was able to convince the public that Coke was something awesome and special. This was not an uncommon marketing trick then or now. In fact, as a part of a marketing stunt back then, it was publicly announced that only two Coca-Cola officials would ever have the full knowledge of how to produce the syrup at any one time when Woodruff got his hands back on the formula. However, while the media was being spoon fed this story and churning it out to the public, at least four people in the company are known to have been able to produce the syrup in full and it is thought that they probably weren’t the only ones. Of course today, all of the people privy to such information are likely under strict instructions to never reveal they know it, lest they want to stare down a life-destroying lawsuit from one of the most powerful commercial entities on Earth, not to mention perhaps losing their jobs if they still work there. This still leaves the potential for someone to go Ocean’s 11 on the written version of the formula. (We can only hope we didn’t just inspire what would no doubt be an extremely lucrative Ocean’s 14 movie given the product placement potential.) However, we weren’t kidding when we said the formula is contained in a cartoonishly secure vault (even if you get into the giant vault, there are still several layers of security you’d have to go through to get to the recipe). 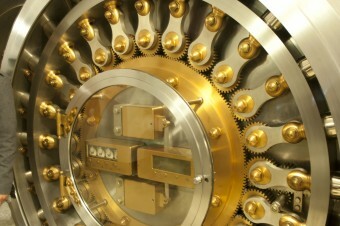 You see, in a much more recent marketing stunt, for Coca-Cola’s 125 year anniversary in 2011, they moved the written formula from one Atlanta vault to an even more secure custom built vault amidst a media circus. The fact that this custom vault is part of “The World of Coca-Cola” and they turned it into an interactive exhibit for the public would, once again, suggest that they’re more concerned with the publicity and enigma surrounding the formula than the actual information it contains. And, even if it was stolen, assuming said paper with the recipe really is in the vault, Coca-Cola could just deny it and claim the recipe was still safely tucked away and it wouldn’t really matter that the true recipe was (seemingly once again) out there for public consumption. Though most American Coke bottlers make Coca-Cola with high fructose corn syrup, Kosher Coke and Coke you find in Mexico (as well as usually the version found in glass bottles in the United States) is still made with cane sugar. While there were initially different versions of Coca-Cola being sold by the different manufacturer’s Pemberton sold the recipe to, all the versions contained cocaine, with some estimates of up to nine milligrams of cocaine per serving. However, Asa Candler claimed that his formulation included only around 1/10 the original formula’s amount of cocaine and by 1903 he removed cocaine from Coca-Cola by using “spent” coca leaves leftover from the cocaine extraction process. This still resulted in Coca-Cola having trace amounts of cocaine though. They’ve since gotten around this with better extraction processes used by Stepan Company in Maywood, New Jersey, as mentioned. While in the beginning carbonation was added to drinks because it was thought it was beneficial to the human body, today carbonation is added for very different reasons, namely taste and shelf life. Carbonating beverages, introducing CO2 into the drink mix under pressure, makes the drink slightly more acidic (carbonic acid), which serves to sharpen the flavor and produces a slight burning sensation. It also functions as a preservative, which increase the shelf life of the beverage. Fluid Extract Coco, 4 oz. Today it’s known that phosphoric acid has come to replace citric acid in the recipe; the amount of caffeine has been reduced; a preservative (glycerin) has been added; the sugar has been substituted for corn syrup by many bottlers; the alcohol portion (unless it’s predominately boiled off) is gone; and, of course, the Fluid Extract Coco has been changed. It’s possible other modifications have been made as well, despite the company’s claim of a moratorium on changes once Woodruff took over. Whatever the case, this recipe jives very closely to what various lab analysis of Coca-Cola indicate make up the drink. IMHO something happened to Coca-Cola after the New Coke period. Growing up we drank Coca-Cola, and I liked New Coke’s taste. However what was renamed Coca-Cola Classic now gives me heart burn which it did not before. I cannot stomach it literally. About that time I met my first wife, whose family were Pepsi afficiandos and made the switch to Pepsi. The only Coke products I drink now are Diet Coke and Coke Zero. My work has taken me to Atlanta on several ocassions for a week at a time, I ask for Pepsi in restaurants just to enjoy the glaring looks from home grown locals. It’s like going to Lynchburg Kentucky and asking for a shot of George Dickel whiskey, which is made in Tennessee. Not being able to stomach Coke after the New Coke incident in the 80’s probably has less to do with a change in the recipe as it does getting old 😀 I’m the same way with certain foods I loved when I was younger. I don’t know about the facts but reading about this makes me want to drink Coca Cola! Perhaps that was meant for advertisement! Fascinating article. One correction: The article states that Kosher coke is made with cane sugar. However, almost all coke is kosher, and contains corn syrup. KOSHER FOR PASSOVER coke is made with cane sugar (since many kosher consumers do not eat corn products on Passover). You can find these in stores in the months before/after Passover. People love to try and decipher secrets. Today we have KFC’s 11 spices and Coca-Cola to fascinate out curiosity bug. Less fascinating is that for a long time, every ingredient in either of the two have been analyzed by chemical engineering students everywhere. I remember my brother telling me about he and his group of students using a couple of differing methods to come up with Coke’s formula all the way from spectra analysis to testing reactions to chemicals. But it has been fun for the companies involved to claim that nobody makes anything that can compare to our _____. As far as suing squealers, I’m sure Coke might try, but they have NO patent protection on the drinks they make. You can try copying all you want, if you are able to obtain the parts of the formula and mix it properly. You could even claim that your Burpacola is a generic for Coke, and there is nothing Coke could do to stop you, intimidate, threaten, yes, stop no. But at $1 a 2-liter bottle, why bother? It’s like making your own air.